Joseph Arnold was born in Clay Cross, Derbyshire on 18 August 1893. His baptism entry in the parish registers, dated 9 September 1893, shows that his father was also called Joseph, a miner. His mother’s name was Elizabeth B and the family are recorded as living on Market Street in the town. By the time of the 1901 census, Elizabeth appears to have died and Joseph senior had remarried. The family had also moved to North Wingfield. It seems that Joseph junior tried to join the Navy in 1912. An admiralty record card survives for a Joseph Arnold. It shows that his father was J. Arnold of North Wingfield, but the birth date is recorded as 18 August 1892, rather than 1893. 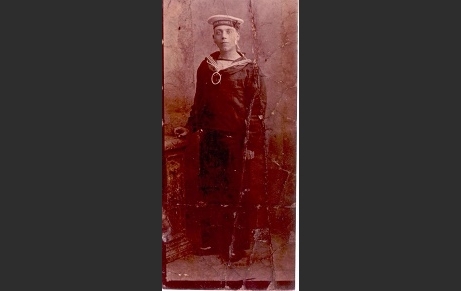 He joined the Navy on 12 June 1912, but only appears to have served until August of that year. His record notes a payment of £10 from his father. It seems likely that this was to buy Joseph out of the Navy as this was the sum demanded to buy a man out, if he had served fewer than three months. If he had served more than three months, the sum rose to £24! According to family lore, Joseph senior sold a couple of pigs in order to buy his son (who had discovered that he hated the sea) out of the Navy. Joseph’s demobilization certificate records that he joined up on 22 August 1914, days after war was declared. However, it would be almost a year later that he disembarked in France; according to his medal card, Joseph arrived in France on 25 August 1915. Although he was originally attested to the Nottinghamshire and Derbyshire Regiment (The Sherwood Foresters), he was transferred to the 18th Battalion Durham Light Infantry at some point during the war. The photograph that accompanies this story was probably taken at the beginning of the war. 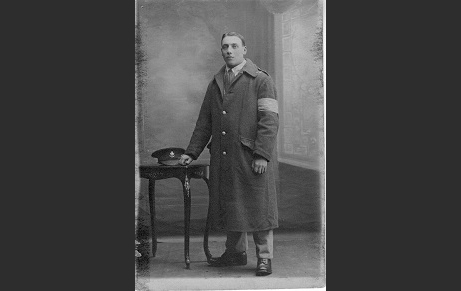 Joseph is not yet in uniform, but is posing with a cap which seems to display the Sherwood Foresters’ cap badge. A newspaper article held by the family (transcript below), shows that Joseph was injured a number of times whilst serving in France and Flanders. Although a date does not appear on the clipping, it does mention that Joseph had been in France for over three years. This would make it likely that the newspaper dates from 1918. Mr and Mrs J Arnold, 5 Draycott Street, North Wingfield, have received news from a hospital in France that their son, Corporal J Arnold, DLI, was wounded in the head on July 18th. This is the fou[rth] time he has b[een] wounded and he has also been gassed. Aged 24 and unmarried, he enlisted on August 18th, 1914, and has been in France over three years. Before joining up he worked at Holmwood Colliery. He was one of the first batch that went from North Wingfield on August 24th Mr Joseph Arnold he [has] two more sons in France, both in the RFA.